A new location of Tampa, Florida-based Outback Steakhouse is planned for Scenic Highway in Snellville. The new freestanding restaurant would be built in an outparcel of the new Park Place development, already home to Cracker Barrel, Freddy's Frozen Custard & Steakburgers and Zaxby's. The new approximately 6,500 square foot restaurant would be built on a currently vacant approximately 1.74 acre outparcel between Cracker Barrel and Freddy's. The restaurant's physical address would be 1750 Scenic Highway. According to Snellville city sources, the project is "moving forward" but is not yet at the point where a construction timeline is available. A five-story, 102 room Hampton Inn & Suites is expected to begin construction soon in the Park Place project. ToNeTo Atlanta reported in June that Outback Steakhouse is also planning a new location at North Point MarketCenter, across the street from North Point Mall, in Alpharetta. Alpharetta sources indicate that site work has started on the Outback parcel. The first Outback Steakhouse opened in Tampa, Florida in 1988. Since then, the chain has grown to be an international brand with 742 domestic Outback Steakhouse restaurants and another 244 units in 21 countries. Outback is the largest division of Bloomin' Brands Inc., a restaurant group that also includes Carrabba's Italian Grill, Bonefish Grill and Fleming's Prime Steakhouse & Wine Bar, each with at least one location in metro Atlanta. Bonefish Grill operates a popular location in The Shoppes at Webb Gin, a large shopping center just north of the planned Outback Steakhouse. Outback launched an aggressive, more modern restaurant prototype in 2015. 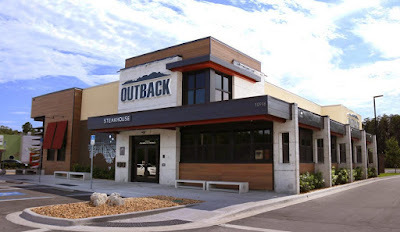 According to Outback’s website, the new restaurant design was inspired by modern Australia and features more earth tones and stonework in its construction. For a cool look at the many iterations of Outback Steakhouse restaurant designs, click here. The new Alpharetta and Snellville restaurants are both expected to be similar to the recently opened modern locations. Outback Steakhouse joins a growing list of restaurants that have opened or are opening along Scenic Highway. In addition to Cracker Barrel, Freddy's and Zaxby's at Park Place, Pollo Tropical opened in late 2015 [in place of defunct sibling concept Cabana Grill] while both Taco Bell and Cook Out opened locations late last year on the site of a former bank. Just north of The Shoppes Webb Gin, Jim 'N Nick's BBQ opened last summer at the new Snellville Exchange shopping center, while Culver's opened a new location earlier this year in a nearby outparcel. Burger 21, which closed after a very short time in business last year, is reportedly on track to reopen later this month after a change in ownership and a renovation. Have you dined at one of the new-look Outback Steakhouse locations? Are you excited for the new and upcoming restaurants along Scenic Highway? What is your favorite eatery on or around Scenic Highway? I have been looking forward to Outback moving to Snellville since I heard the first rumors in early 2017. I was told the groundbreaking would be summer and opening by the end of the year. Guess that timeline has been pushed back. The sooner the better. Do not care for Outback or any of the chain restaurants. They will do very well as that seems to be what is moving the mainstream to Snellville. Prefer to buy specialty items at The Fresh Market and dine in tranquility at home. Burger 21 is saying they will reopen on August 14th. I remember years ago driving from Snellville all the way down 78 to the Stone Mountain Outback to eat dinner. Snellville seems like an ideal location for an Outback. Outback = overrated. I just went to a brand new Outback like the one you have pictured. It's been years and I wanted to give it a try and it validated why I will not go back. The restaurant doesn't seem to have a good traffic flow and the food was OK but cold. Nothing special. I had the ribs and my mom had steak. Both warm to cold. Bread/salad was good. Mac n cheese (Gouda) good but small in proportion. Good luck to them. Can’t wait until Outback opens!. There is no reason for a hotel in Snellville. Rumors that there will be a Fazzoli's coming to Snellville. Is this true? Sure hope so! Can't wait for Outback to move to the Snellville location which will be more convenient. I hated the location & surrounding area in Stone Mountain. I hope the new place will be cleaner and more desirable looking also. I loved the Outback in Delaware in the 90s. The management was great, the food was perfect. I haven't been in years because the one I went to in Stone Mountain was dirty, the wait staff.... that's all I'll say and the food was not the quality it was in the 90s. I will say this unless the Cracker Barrel starts hiring better wait staff I won't be back and I couldn't wait for them to build one here. I go to the one much further away as the service is good and the staff is good. It is also cleaner. If the outbackwill hire good people and keep the place clean AND the food is good. I'll be back more than one time. Please bring the Cheese Cake factory to Snellville!! God, how much more are they going to build up 124 to the exclusion of everyone else in the community. Not everybody lives in BROOKWOOD.